Whomp whomp. There're no Batman 1989 (Deluxe)s for sale. Bought this to compliment my '89 Batmobile. Do be careful when handling this figure. The entire suit is made of rubber while the cape is of synthetic leather. I consider this to be one of the top 3 Hot Toys figures. Everything about this figure is done well: likeness, costume, accessories, etc. This figure would have been made better if Hot Toys came up with a less obtrusive way to incorporate the PERS system. I've been waiting over 20 years for a decent scale version of this Batman, and Hot Toys did not disappoint! 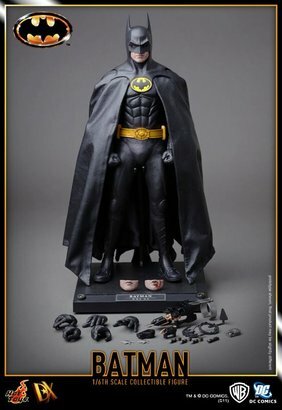 With the multiple mouth inserts and more Bat-gadgets than he could possibly hold, this figure is amazing. The likeness is spot on, I currently have him posed on the coffee table and his profile is dead on Michael Keaton's chin and mouth. My only complaint is the seam in the back of the head (for the PERS eyeball system) is rather obvious across the top, especially for a one piece cowl.